Here we hope to help you with some the acronyms, terms and words that you'll comeOctober 21, 2004 22:59evolving as time allows. A rotor head design where the main rotor blades are free to change their angle relative to the mainmast, under control of the pilot. 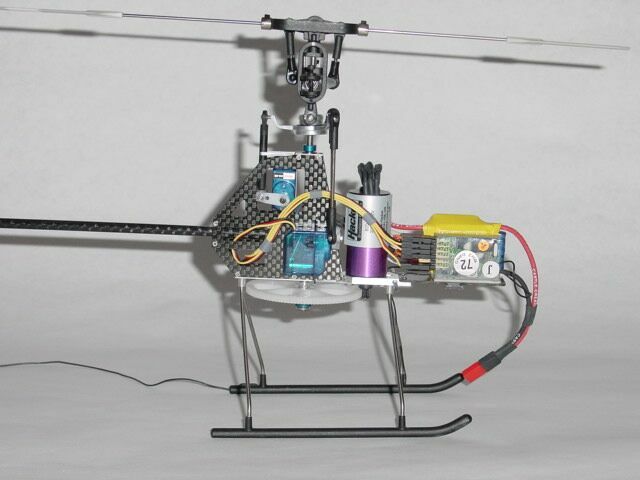 This is the normal control system for both full-size, and larger model helicopters. Both positive and negative pitch angles are allowed, with negative angles being required for inverted flight, rapid controlled descents, and auto-rotations. CP gives far more precise control of the aircraft in all flight regimes, but especially in the vertical axis. A rotor head design where the main rotors are attached to the rotor head at a fixed angle (or pitch).relative to the main rotor mast On a fixed pitch helicopter, vertical control is attained by speeding or slowing the main motor. This causes the main rotor speed to increase or decrease, which produces more lift (and a subsequent climb) if increased and less lift (and a sink) if decreased. With Micro Helis, FP is far more common than CP. A bit of a misnomer really., headspeed is a generic term for the speed of the main rotor measured in revolutions per minute (rpm). 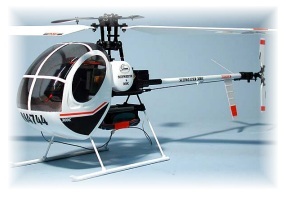 In general terms, the higher the headspeed, the more precisely the heli will handle. The lower the headspeed, the more 'mushy' the heli becomes. 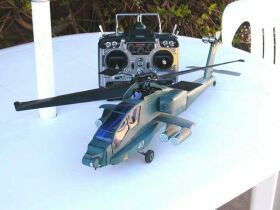 The airborne component of your Radio Control Equipment that collects the radio signals from your transmitter, and decodes them into commands to be sent to the servo's and ESC. An electro-mechanical device that takes the decoded signals from the receiver and translates them into movements of the control surfaces. Standard measurement for battery capacity, expressed as the ability to deliver a certain current draw for a certain period of time. Generally today these measurements are expressed at the one hour rate. For example, a 1200 mah battery would be expected to be able to deliver 1.2 Amps (1200ma) for approximately one hour before going flat. You'll notice the addition of a 'loss' column above? Micro Helis generally draw somewhere in the 2-3 Amp range, and at this point we discover that all batteries are not created equal. Although all batteries should be able to deliver their one-hour rate current, many batteries 'loose' capacity when drained at currents exceeding the one hour rate. The amount of loss depends not only on the chemical makeup of the battery, but also on the manufacturer. In general, good quality NiCads and the new Hi-drain Li-polys will loose very little capacity, whereas NiMh cells can loose 30% of capacity under loads greater than 1C. (For an explanation of 'C' see its entry in this glossary). The figures above are pretty indicative of 'real world' flight times, so you can see why people are flocking to the new Li-poly batteries. A word about manufacturers. There is a wide range of quality in battery cells, and some cheaper cells may claim high mAh ratings but be totally unusable for Microhelis. I had a 300mah nicad pack that would happily deliver 300mah at 30ma drain (useless for our purpose), but at 3 Amps would only deliver 150mah! So what theoretically should have been a Six minute flight pack actually struggled to give me 2 and a half minutes! 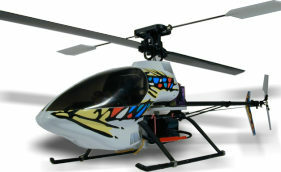 In the worst case scenario, a battery may be not be able to supply enough power to get the Micro-Heli into the air. So, when purchasing batteries for Micro-Helis, it pays to check with other flyers to see what batteries perform best under Micro Heli loads. C - Current expressed as a ratio of rated capacity. C is a way of expressing current draw (or charge current) as a ratio of the battery's capacity. You will usually find C in manufacturers specs, in regard to charge/discharge rates, and it is normally preceded by a number, such as 1C, 2C, 4.5C. So what does it actually mean? Well it's easier to demonstrate, than explain it. One well known NiCad/NiMH battery rule, is that the initial charge of a new battery should be 12-14 hours at 1/10C. This means you should charge the battery for 12-14 hours with a current no greater than one tenth of the battery's rated capacity. So if it is a 250mah NiCad you'd charge it at 25mA, a 2000mAh battery would be charged at 200mA, and a 720mAh NiMH at 72mA. One 'nice' use of C which is just starting to catch on is in relationship to a batteries capacity under load. If you've read the mAH entry, you will have seen mention of the fact that batteries 'loose' capacity when the load exceeds 1C. Manufacturers of the latest hi-discharge li-poly cells are starting to list not only the one-hour capacity, but also the expected capacity under load. Taking the new Kokam 1500 as an example, the cell's nominal (one-hour) capacity is 1500mAh, but Kokam also give us another rating to work with - 8C/82%. This tells us that at 8C discharge, we can expect to obtain 82% of the nominal capacity of the battery. Working this out we find that at a 12A (8 X 1500mAh) discharge this battery will still deliver 1230mAh (82% of 1500mAh) of capacity. Pretty darn impressive eh?. So, in summary, take the rated capacity of the battery as C, multiply that by the number in front of C and you have the current. A device designed to maintain a constant headspeed regardless of the pitch angle of the blades. 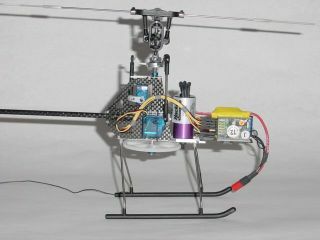 A well set-up governor arrangement will allow the heli to be flown using only collective pitch. This eliminates the need to set up throttle curves, and makes the handling of the aircraft far more consistent across a wide range of flight modes. A governor is not a necessity, but it is a nice thing to have.